None of my bikes have ever taken me to a level that would compel me to use the above term to describe their velocity, but over the last two weeks I spent each day trying my damndest not to crash a machine that would hit the above performance threshold with ease. 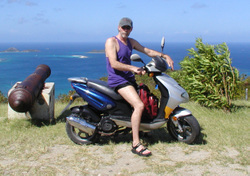 When Emilia and I arrived on the island of Carriacou (just off the coast of Grenada), I was delighted to hear the news that we could rent a two wheeled conveyance in lieu of the traditional Suzuki Samuri. “A scooter was available” we were advised, and not knowing any better, I jumped at the chance to get some riding in during our vacation. So arrangements were made and I was able to pick up the CPI Hussar 125 at the island’s only gas station within four hours of our arrival on the island. Not a bad looking mount (for a scooter), the Hussar boasted a 125cc 4-stroke motor, single-sided swing arm, cast mag wheels and a hydraulic front disk brake. 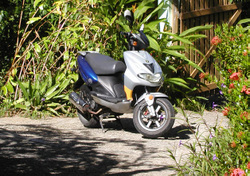 So after a brief orientation of the bike, I set off for a solo trip back to our villa and as I wound my way through the streets of the island’s main town, Hillsborough, I immediately noticed that the bike wanted desperately wanted to fall on its face and wouldn’t hold anything approaching a line (even a straight one). No problem – I’m a skilled professional after all – I set my sights on the rise that led to a sweeping left and a 500 meter straight section and gave the CPI a handful. Breakneck Speed was attained in a heartbeat it seemed as the speedo hit about 60KM/hr. Without a moments notice, the bars set into a blurring tankslapper and the mighty Hussar made its first attempt to spit my down the road clad only (of course) in shorts, sandals and a t-shirt. I spent the remaining 10 minute ride back to our villa trying to sort out the cause of the evil handling and concluded that at least a good part could be attributed to an incredibly loose steering head and exceptionally low tire pressure. The next day, we stopped in at the town’s only gas station to top up the tire pressure and discovered that the locals maintain a steadfast belief that low tire pressure was the secret to tire longevity with the islands really poor secondary roads (which meant multiple trips back to the gas station to sneak the pressures back to OEM spec while no one was looking. With the pressures up to 35psi, the Hussar steering approached something akin to neutral and a later solo test showed that Breakneck Speed had been moved up to 80KM/hr. Frankly, given our riding apparel 80KM/hr was more than fast enough and by the end of the vacation, the Hussar had redeemed itself by running us up and down some pretty steep and daunting, rain washed dirt roads and providing a superb platform for touring the island. And the really good news is that 14 days of two-up riding proved that my elbow had healed enough to give me a nice warm fuzzy feeling about the coming season and no fewer than a dozen scheduled track days at Mt. Tremblant, Calabogie and Mosport.